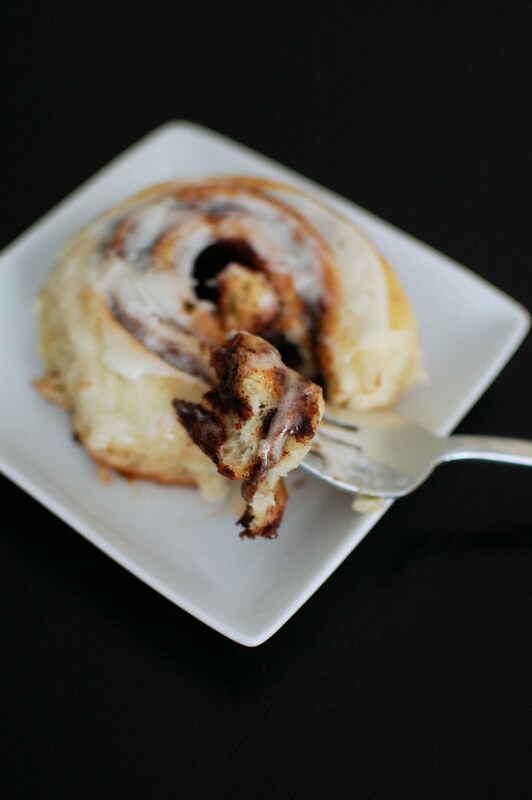 I love, love, LOVE cinnamon rolls. They are absolutely one of my favorite things to make at home. 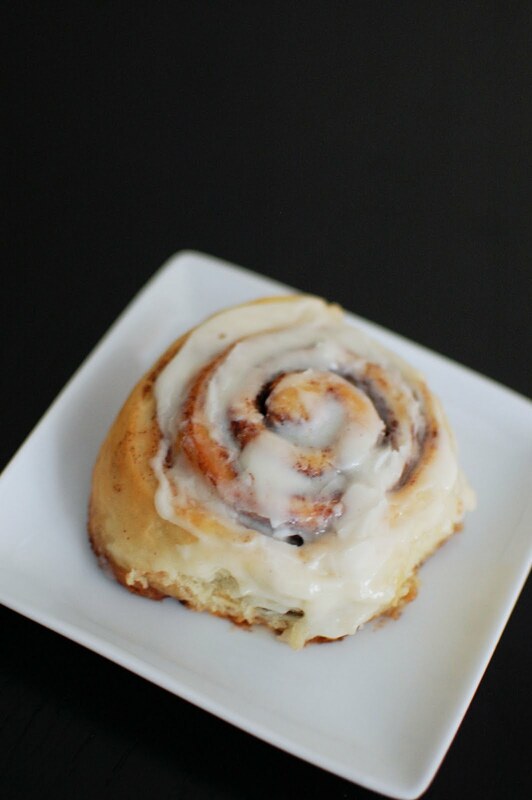 Name one thing that smells and tastes better than a warm cinnamon roll fresh out of the oven, slathered with melty gooey cream cheese frosting. I don’t think there’s anything in existance that sounds better than that! Of course you guys already know of my love of cinnamon rolls. 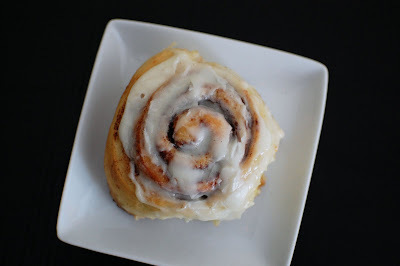 After all, I have blogged about an overnight cinnamon roll recipe, cinnamon roll cupcakes, cinnamon roll monkey bread, and of course the shortcut version – cinnamon roll bread. I even made pumpkin cinnamon rolls last winter too! But all of those can easily be forgotten by this recipe I’m posting today. I’m declaring this my go-to cinnamon roll recipe. I’m not trying any other recipes out there, because these guys come out so tender and pillow-ey with a super cinnamon-ey filling. Basically, they’re exactly what I’m looking for in a cinnamon roll. To make things even better, you don’t need to use a mixer. I realize that could be a downfall in some people’s eyes. But sometimes it’s nice to do things with your hands and a wooden spoon. I’m sure many of you guys have seen this recipe before. It’s from the Pioneer Woman. When she makes it, it yields something crazy like 50 cinnamon rolls. I guess when you live on a ranch, you might have a need for 50 cinnamon rolls. I live in a 750 sq-ft condo with Hubby. 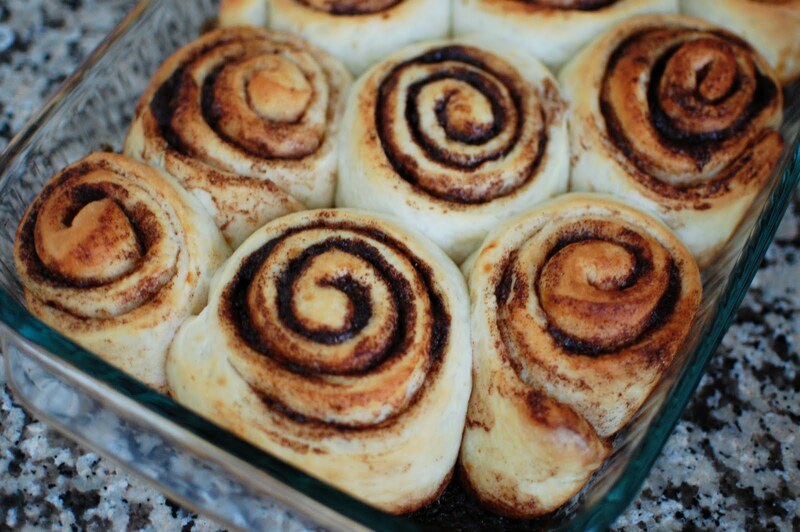 We definitely don’t need 50 cinnamon rolls in our house. So I cut the recipe in half. That still gave us about 24 cinnamon rolls. But I baked them on a Sunday and sent the rest of them to work with Hubby. (Although I have to admit, I regretted not sneaking one into my lunchbag a few hours later when I was sitting at my desk craving a cinnamon roll). Mix whole milk, vegetable oil and sugar in a pan. Scald to 150 degrees. Let cool until lukewarm (~45 minutes). Sprinkle in yeast and let sit. Then add 4 C flour, stir mixture together. Cover and let sit for one hour. Add 1/2 C flour, baking powder, baking soda, and salt to the dough. Stir mixture together. Divide the dough in half. Sprinkle surface generously with flour and form into a rectangle, roll the dough thin, maintaining a rectangular shape. Drizzle melted butter over dough. Sprinkle with sugar and cinnamon. 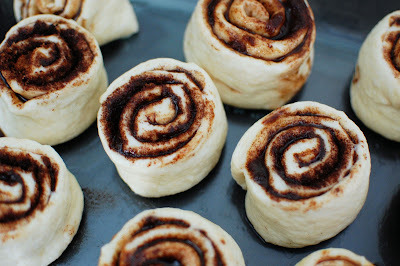 Roll the dough toward you. Pinch the seam to seal it. Grease foil cake or pie pans. Cut rolls 3/4 to 1 inch thick and lay in greased pans. Repeat with other half of dough. Cover the rolls and let sit for 30 minutes. Bake at 375 for 15 to 18 minutes. Generously drizzle cream cheese frosting over warm rolls after they come out of the oven.